A relaxing patio with two rocking chairs greets you when you arrive and is the perfect place to sit and look out at the Sunday Houses lining this street in the Historic District. Once inside, you’ll find stylishly luxurious furnishings in the living area perfectly arranged to enjoy either the gas fireplace or the 42” TV. 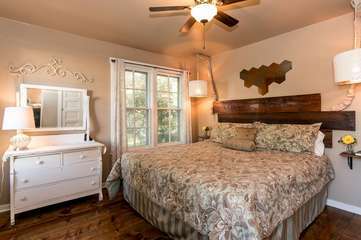 The focal point of the bedroom is the King size bed with contemporary linens and balanced by the reclaimed wood acting as a headboard. The kitchen which has a delightful industrial feel is equipped lightly with a refrigerator, coffee bar, microwave and toaster oven. Just outside, you’ll find your outside idyllic oasis complete with a hot tub, outdoor fireplace and bistro table.